Garrett Bradbury is constantly named as the best interior offensive lineman of the 2019 draft class. The senior had a phenomenal collegiate career at N.C. State. He was simply dominant on the offensive line. 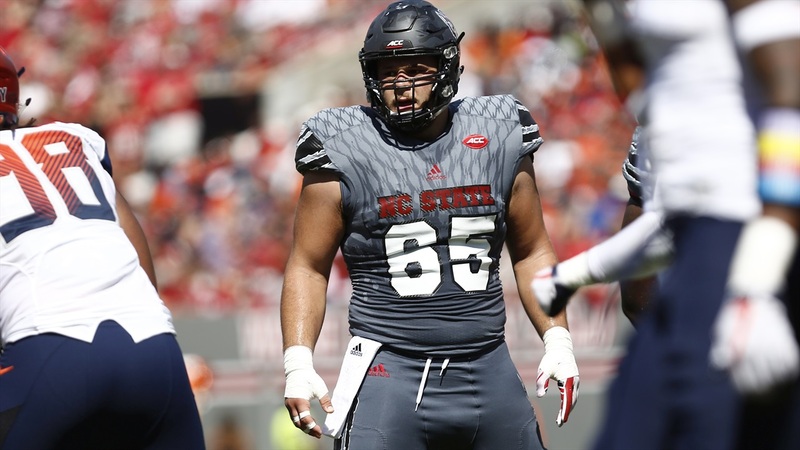 Bradbury played center for the Wolfpack, but many scouts believe he could flex out and play as a guard at the next level. For the Ravens, this transition would make the most sense. The Ravens can draft Bradbury with the 22nd pick in the NFL Draft and could find an offensive line starter for the next ten years. But will the Ravens pull the trigger, and should they? What is clear about Garrett Bradbury is that he is strong. His raw strength was not only seen at the combine, where he bench pressed 34 reps of 225 pounds but on the game tape as well. It is clear by his playstyle that Bradbury uses his strength to his advantage. He often pushes defensive lineman straight into the ground, especially on run blocking assignments. By doing this, he both neutralizes a threat and opens a lane for the running back. He does this so often, that he makes it look easy, but easy it is not. Garrett Bradbury gets off the line and makes the first contact with defenders quickly. This and his overwhelming strength are not surprising when one takes into account his explosion number. As reviewed in the last prospect review article, an explosion number is a measurement of potential for an offensive and defensive lineman and edge rusher. It is calculated by finding the sum of bench press reps plus the vertical jump in inches plus the player’s broad jump in feet. A player with an explosion number of 70.0 or higher should catch the eye. Garrett Bradbury’s explosion number is an impressive 73.67. This validates what we see on tape as not an anomaly, but a tendency. Garrett Bradbury also seems to have a high football IQ. While it is not possible to perfectly detect this from the tape, one can see that Bradbury consistently makes smart moves. The center position is one that requires intellect, as the center is responsible for setting blocking assignments and schemes. Not only does he lead the offensive line to success, but he makes smart blocking plays. He often picks up unblocked pass rushers once he realizes a supporting guard can take his man. He moves on and picks up high priority pass rushers that could devastate the quarterback if left unchecked. Garrett Bradbury is also quick and agile. He makes quick moves, and uses the pace of his feet to compliment his strength, and push defenders away. Bradbury is versatile and should be able to transition to guard if needed. He is fast for an offensive lineman, which paired with his quickness, would help him on swing blocks and techniques that a guard needs to be proficient at. Although I believe that Bradbury could make the transition to guard, it may not be easy. The Ravens would have to train him to be a guard, and he would discard years worth of success at center. He would simply be more effective at center than guard. It could be a mistake for the Ravens to draft him as a guard and expect him to see the same amount of success he had as a center. Many players trip up in transitions at the next level. The process could hinder Bradbury. Bradbury also lacks size for his position. By no means is he too small to play interior offensive line, but he is not big for his position either. He lacks the size to make him a giant to opposing defenses. He simply looks like just another lineman. If his relatively small size concerns the Ravens, he may not be the best prospect for them. Garrett Bradbury is one of the best interior offensive line prospects in this year’s NFL Draft class. But where the Ravens need a guard, Bradbury is clearly his best at center. A transition to guard would risk his future for a short term fix. As a result, the Ravens may want to steer clear of making him adjust. Grade: 8.0 – Mid first round pick. Should the Baltimore Ravens Draft Garett Bradbury? Only if the Ravens want to upgrade from Matt Skura. If not, the Ravens should find interior offensive line help elsewhere in the draft.